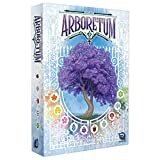 You must choose wisely which trees to plant and which to keep in hand, as this balance will ultimately determine who among you has created the most sumptuous arboretum. 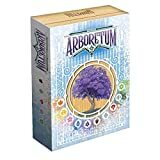 Score the most points at the end of the game by creating the most sumptuous arboretum. This game is composed of 80 cards in 10 different colors, with 8 cards (numbered 1 to 8) in each color. All cards are used in a 4-player game; with 3 players, 2 colors are returned to the box; and with 2 players, 4 colors are returned to the box. It does not matter which colors are returned to the box when playing with less than 4 players. The player who last watered a plant is the start player. The player to her right is the dealer, who shuffles the deck and deals 7 cards to each player. These 7 cards form the player's starting hand. The remaining cards are placed in the middle of the table to form a draw pile. 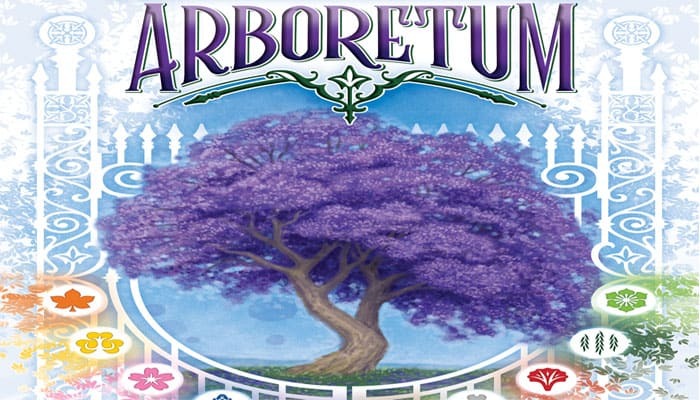 On her turn, a player must, in order: draw 2 cards, play 1 card into her arboretum, and end her turn by discarding 1 card. The game continues with the next player in clockwise order taking their turn. Draw 2 cards, one after the other. Cards may be drawn from the top of the face-down draw pile, or the top of any player's face-up discard pile (including one's own discard pile). These 2 cards may be drawn from the same or different piles. On your first turn, place a card from your hand face up in front of you. This is the start of your arboretum. In following turns, cards must be placed adjacent (horizontally or vertically) to previously placed cards. Once a card has been placed, it may not be removed, moved or covered by another card. At the end of your turn, you must discard a card into your discard pile (see example on page 3), so that you have exactly 7 cards in hand. The game ends when there are no further cards in the draw pile. The player who drew the last card plays her turn normally, and then scoring occurs. A path is a sequence of cards of increasing value, where the first and last cards are of the same color. The dealer names each color, one after the other (referring to the score pad). For each color, the players reveal each card in their hand matching that color. 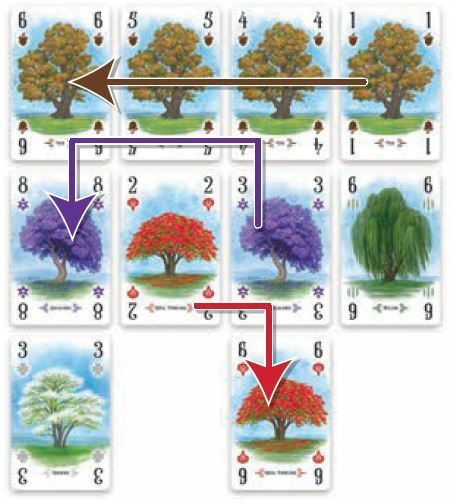 The player who has the highest sum in a given color gains the right to score points for a single path matching that color in her arboretum. In case of a tie, all tied players gain the right to score one path of that color. Exception: If a player has the 8 of a color in her hand, but one of her opponents has the 1 of the same color in his hand, the value of the 8 is reduced to 0 when determining which player has the right to score paths of a particular color. The 1 is always worth 1. (See scoring example). Note: It is possible to gain the right to score points of a color of path that is not present in your arboretum. If no player has cards of a particular color in their hand, then all players have the right to score points for paths of that color. Along a path, each card must be greater in value than the one preceding it. Therefore, the smallest possible path is made up of 2 cards of the same color, and the longest is made up of 8 cards (this path must start with a 1 and end with an 8). The only cards that must match the color being evaluated are those at the start and end of the path; the color of the cards in between are only of importance in determining the value of a path. Score 1 point for each card in the path. Score 1 additional point for each card in the path if it is made up of at least 4 cards and they are all the same color. Score 1 additional point if the path begins with a 1. Score 2 additional points if the path ends with an 8. Note: A tree may be used in more than one path. Once the sum of each player's scored paths is determined, the player with most points wins. In case of a tie, the player with the most colors present in her arboretum is the winner. If there is still a tie, the players must each plant a tree. In 5 years' time, the player whose tree has grown the tallest wins. Clark: Jacaranda 7 (7), Lilac 13 (6+7), Oak 11 (3+8), Royal Poinciana 6 (1+5). Jonathan: Jacaranda 7 (2+5), Lilac 9 (4+5), Royal Poinciana 3 (3), Willow 7 (7), Cassia 6 (6). Martha: Cassia 5 (5), Oak 9 (2+7), Royal Poinciana 0 (8, but Clark has the 1), Willow 12 (1+3+8). Clark scores points for his paths: Jacaranda, Oak and Royal Poinciana. Clark doesn't have any Lilacs in his arboretum. 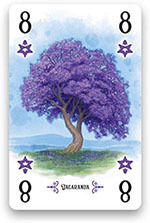 However, Clark has succeeded in preventing Jonathan from scoring points for Lilacs, as he has a greater sum of Lilac cards in his hand than Jonathan. Jonathan also score points for his Jacaranda paths (as he is tied with Clark), as well as his Cassia paths. Martha will only score points for her Willow path. Clark's final score is 19 points (the square brackets indicate which scoring conditions were met.